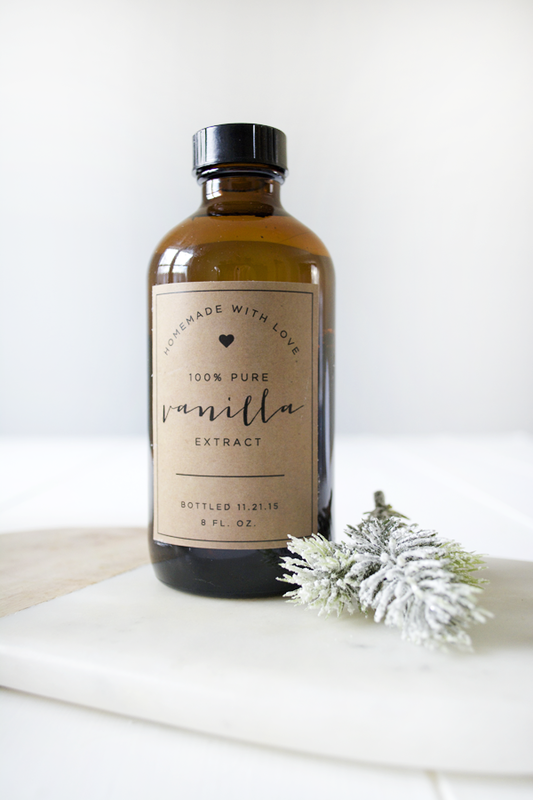 I promise I’m not turning this blog into a food blog, but I couldn’t resist sharing this super easy DIY gift that’s perfect for Christmas: Homemade Vanilla! Plus you get a super cute printable to go along with it 🙂 This stuff smells absolutely amazing and lasts a long time. I kept a bottle for myself and use it in all my baking. 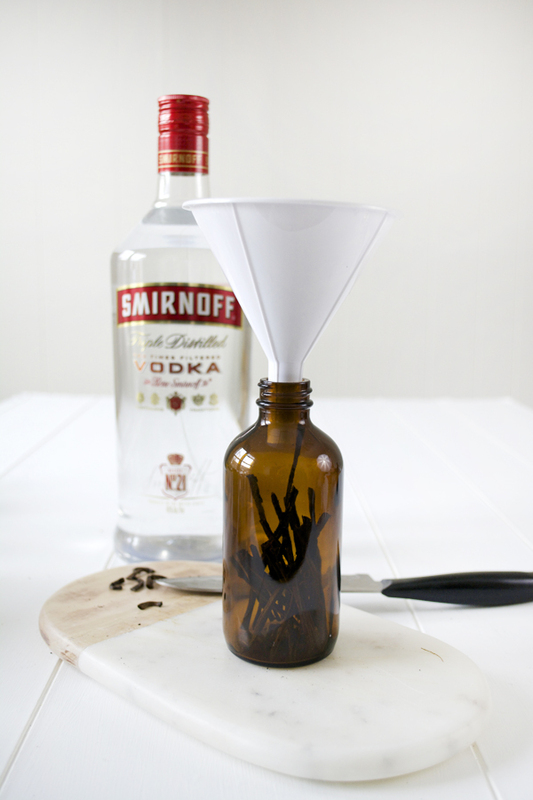 One thing to remember about making pure homemade vanilla extract, is that it takes time for the vodka to be fully infused before it’s ready to use. The recommended time is 2 months, but after a month, you can open your bottles and see how strong they smell. 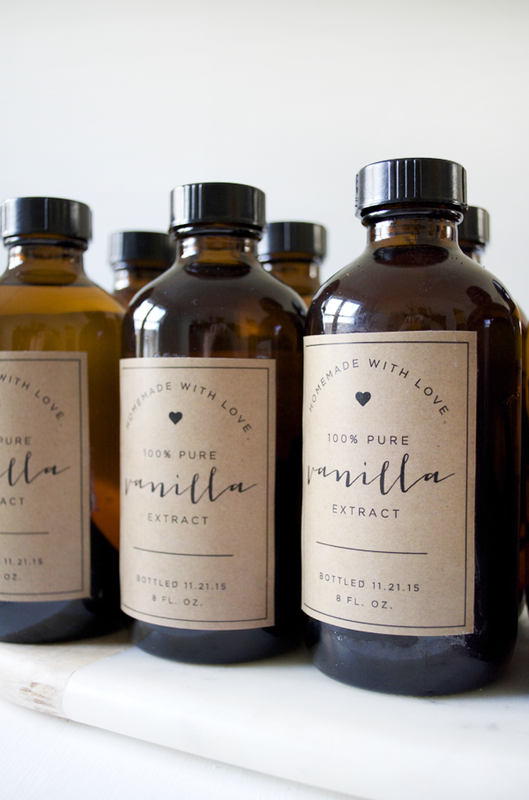 If you plan on making these as gifts, just make sure you let your friends and family know when you bottled them, and when the vanilla will be ready. There are so many different types of beans you can use. I went with these Madagascar Bourbon beans, and they smell SO good. 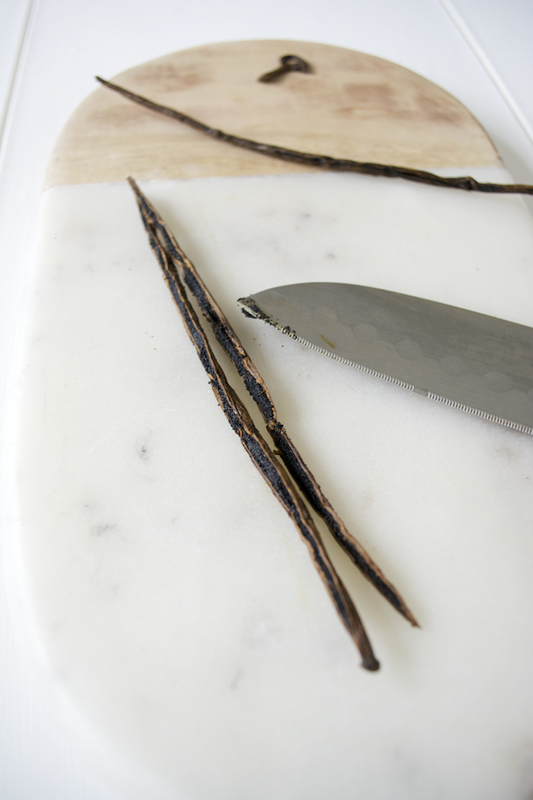 Cut your vanilla beans in half length wise. I found it easiest to cut the actual bean in half first, and then slice them down the middle. Make sure you have a good, sharp knife; it will make this step much easier. And watch your fingers! Then cut out your pretty labels, glue them on and you’re done. Told ya it was easy! I printed my labels out on some pretty kraft colored cardstock and glued them on using super glue which held up great! I can’t wait to give these little guys away as gifts this year! You can also print out some of my free holiday gift tags to use to wrap them up! UPDATE: My bottle of homemade vanilla extract lasted almost 3 years. I’m not a frequent baker but I do bake from time to time and I was surprised how long this lasted me! Love this! 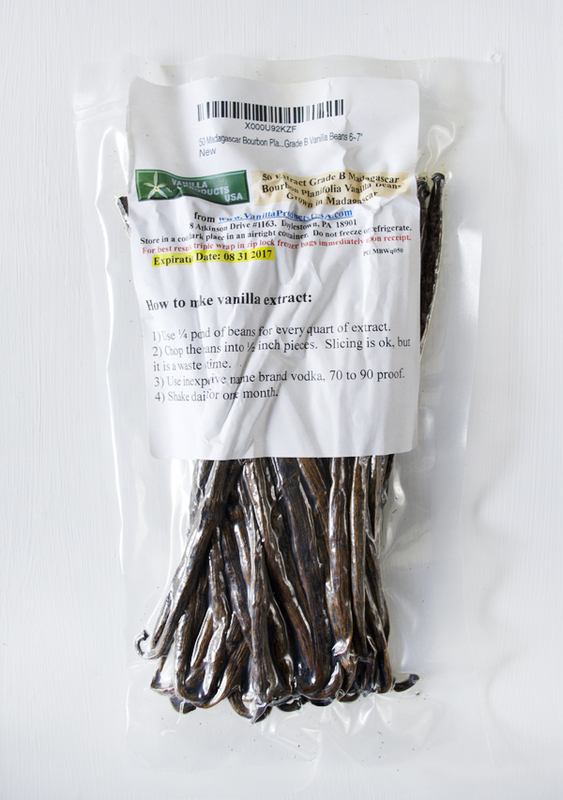 When you say “5 – 6” vanilla pods per bottle, are you talking the whole pod or halves? So for the 10pk beans you bought that made 2 bottles? If I were to make this in the summer, would it be too strong or expire if I were to give them as Christmas gifts? Nope it would be perfect! Can you tell me what the shelf life is, from start to expiration? 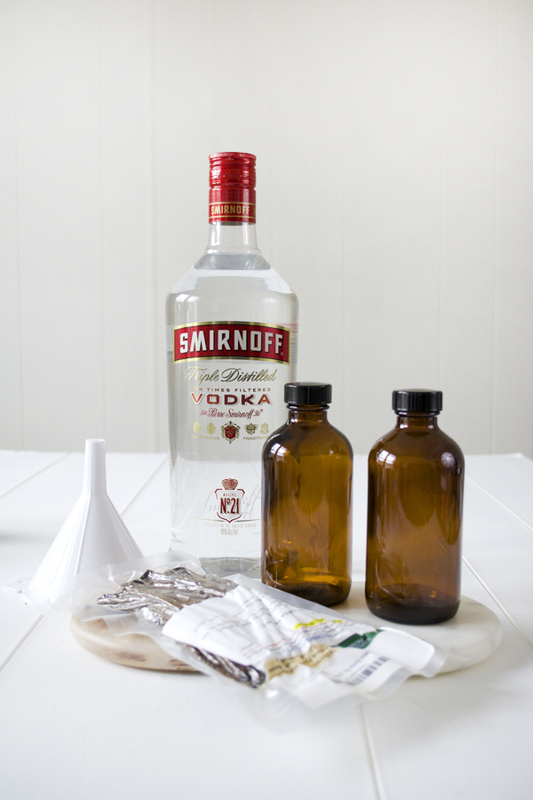 I’ll probably sound like an idiot for asking this, but does this recipe create a higher alcohol level than the store bought stuff? Not stupid at all! I’m actually not sure myself ha. I think it might be only because it literally only has vodka and vanilla beans whereas the store bought kind has some other ingredients. I got them on Amazon! There is a link to buy them in the post! I get 10 Madagascar Vanilla Beans at Costco for $15.89, which seems to be about half of what they are charging on Amazon. The Costco beans are about 7 inches long. I live in VA, so the price may vary a bit by region, but it’s still got to be way better than $30! Do you leave the vanilla bean in the bottle indefinitely? Does that mean that they could keep adding vodka as they used it? Thanks! Hi there, I’ve been making this for years. I occasionally add fresh vanilla beans, but I do leave all the originals ones in. What is the font for the rest of the label? What a great gift idea! Your label is beautiful! waouh Im so impressed ! I’m sure going to do this. What kind of paper do you use for the labels ? Thanks and hello from France ! 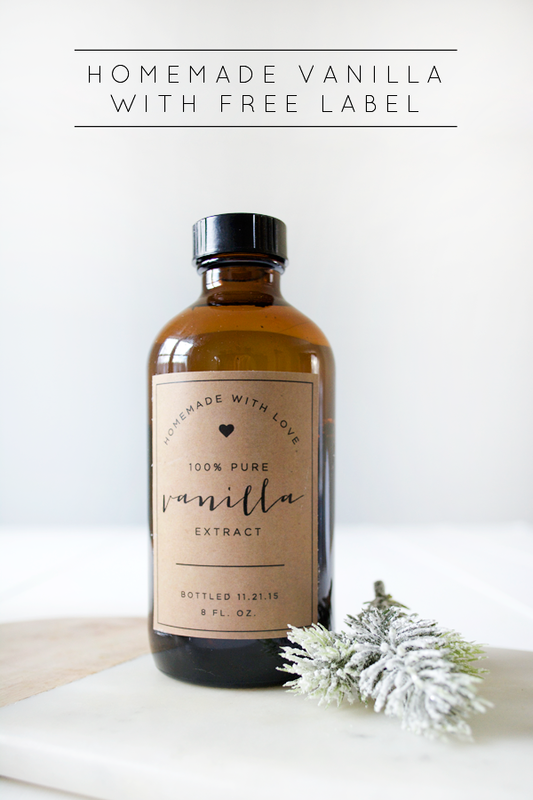 I love making homemade vanilla and this label is perfect! I looooove vanilla and these are the cutest little bottles I have ever seen! This is such a genius Christmas gift idea. Love your labels, too! Hi Laurel! The brown bottles are from amazon, there is a link in the post to them 🙂 And I just used super glue to attach the labels! This is amazing! And I love the labels, so elegant. This would be such a fun gift – who wouldn’t want one of those cute little bottles on their shelf? Great idea! Right? I think I might need to make some more! Absolutely gorgeous! Will have to make these this year! Thank you so much, Melissa!! Thanks girl! And so easy to make! 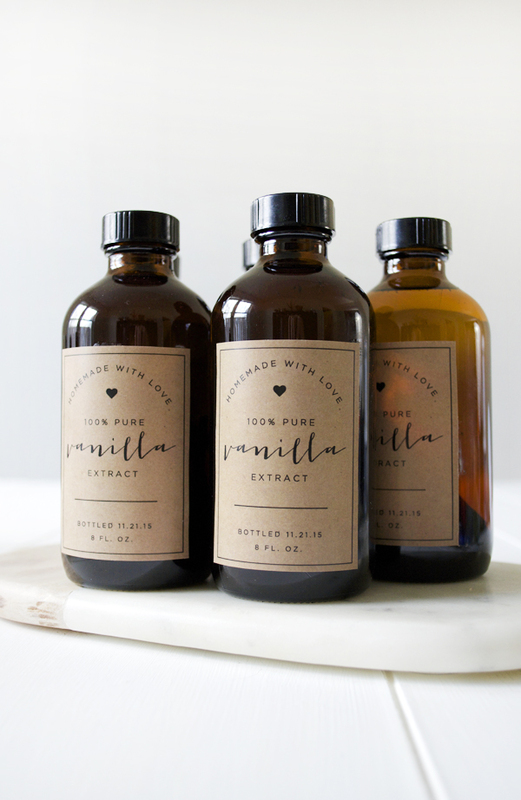 Wow, I had no idea how easy it was to make vanilla! This is awesome! Oh my gosh Bre, these are beautiful and your label you created is super cute! Such a great handmade gift idea! Thank you so much, Katie!! This has been on my to-do list forever, I’m glad I finally made it! Hello! Any chance you would be willing to share an editable version of the beautiful you created? My bottles are only 4 oz.. Thanks so much! Thanks so much!!!! Our bottles are 4 ounces, so that’s what I need to print. I am happy to make the change and send it back to you for posting. Just lmk. Thanks!!!!! Hi Bre!! I love your labels but do you by chance have 5 oz labels? If not could you tell me how to change it so I can use them! Thank you so much!! Thanks Liz! Do you want the label size to be smaller as well, or just want the 8 oz. text to be changed to 5 oz.? If you could resize the picture that would be great! But if not I am sure it will still work! 🙂 thank you so much!! I would love a smaller size for 4oz. bottles as well. Please and Thank You!